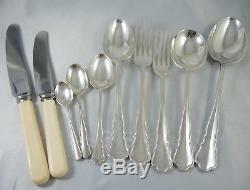 Vintage Australian Fairfax and Roberts Silver Plate Dubarry Cutlery set for 6 people. This cutlery set is marked for Fairfax and Roberts, jewellers and retailers in Sydney since 1858. This cutlery set is a vintage set and in beautiful condition. Each piece is marked for Fairfax and Roberts. The knives also have the marking fo Harrison Bros & Howsen and Alpha Stainless. This often happened in Australia with knife blades. You will find other Australian brand cutlery marked to the blades with their own mark as well as marked made in England. For example, Rodd and Grosvenor. The design is Dubarry with elegant and simple lines to the pattern. This is a setting for 6. The pieces are solid and realtively heavy so feel really nice to hold. Xylonite (imitation bone) handle dinner knives, 6 Xylonite handle entree knives, 6. Large forks, 6 entree forks, 6 large soup spoons, 6 dessert spoons, 6 teaspoons, 6 coffee spoons, 6 eggspoons and 2 table spoons. As mentioned above all are in lovely condition. The plating is reflective and shiny. There are a few minute scuffs and scratches from use but no silver plate wear through or loss. We have more cutlery on our website. You can also find us on facebook. Please note this item is original and not a modern day reproduction. We do not mark merchandise values below value or mark items as "gifts" - US and International government regulations prohibit such behaviour. The item "Vintage 6 person Australian Fairfax & Roberts Dubarry silver plate cutlery set" is in sale since Wednesday, October 25, 2017. This item is in the category "Antiques\Silver\Silverplate". The seller is "*emprades*" and is located in Clarendon, South Australia. This item can be shipped worldwide.